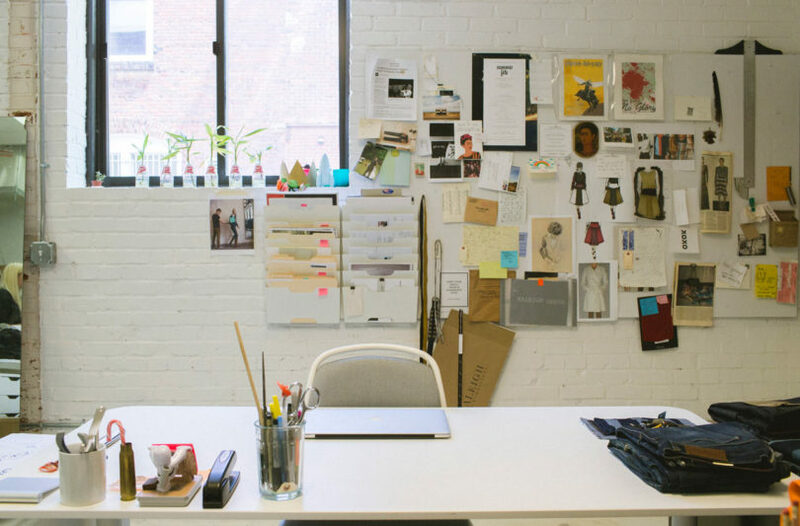 When Raleigh Denim launched in 2007, their goal was simply to make a great pair of jeans. 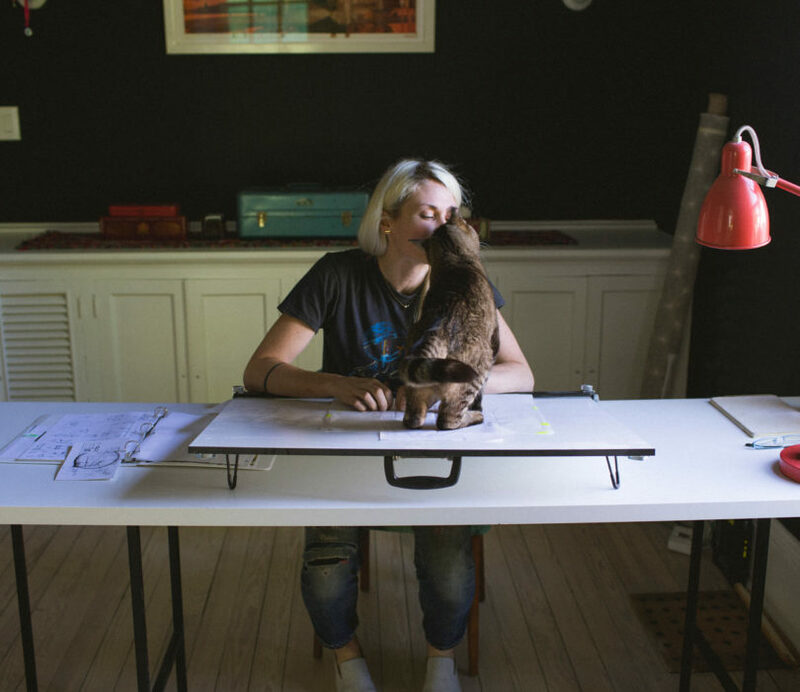 They made every pair by hand out of their apartment, initially selling to friends and family and then expanding out-of-town when they received an order for Barney’s. 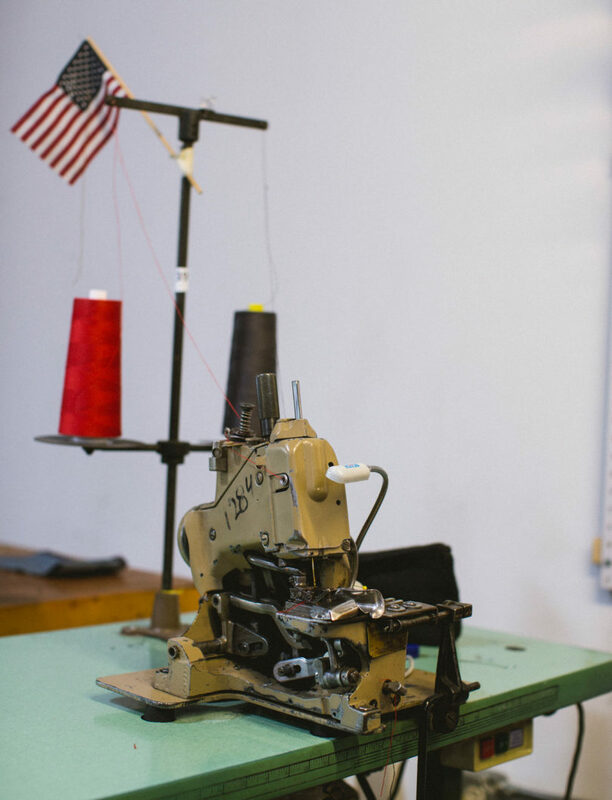 Over time the brand organically grew and with growth, their need for additional sewing machines sent them down the rabbit hole of North Carolina’s prominent textile industry. 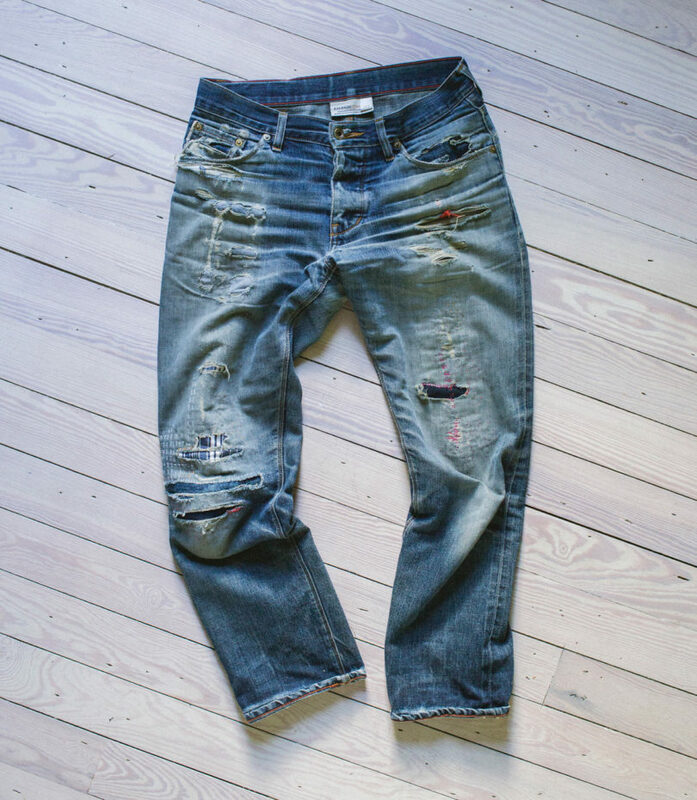 Today, each pair of jeans is made on their old textile machines they’ve restored by expertly trained jeansmiths, each of which are taught to make the jeans from raw fabric to finished pair. The brand hasn’t stopped at jeans though – they’ve been collaborating with Bernhardt Design for the last few years on textiles and a recently unveiled work table and seating collection. 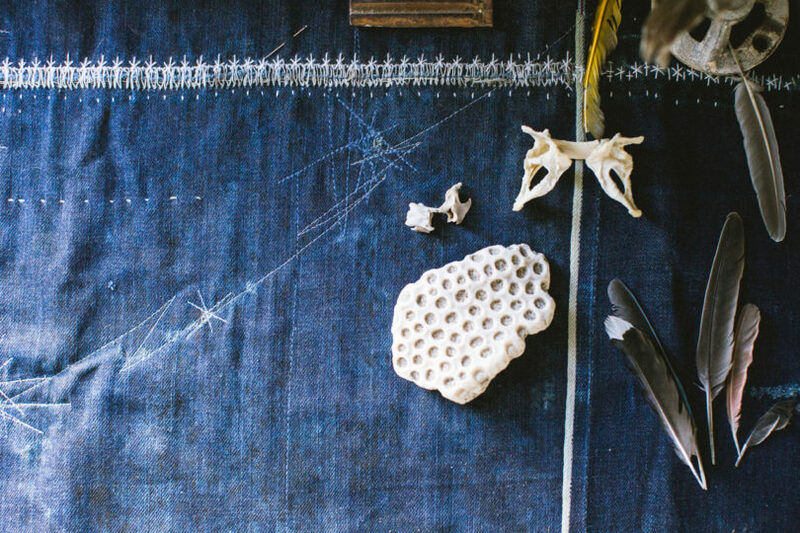 The co-founders behind the Raleigh Denim Workshop brand, Sarah Yarborough and Victor Lytvinenko, are celebrating their 10th anniversary this year and today, Sarah is graciously giving us a look behind the scenes at their workshop, home studio, and her work style, in this month’s Where I Work. My work style is a mash-up of regimented and haphazard. I block time off on my calendar for different parts of the job – I schedule design time separate from time for more admin/operational work; paperwork and spreadsheets can put a real damper on my creativity. Within those blocks of time, especially the creative, I’m not very regimented. I do make tons of lists, though! They’re all over the place…on Post-its, notebooks, Google docs, and the back of my hand. I have trouble remembering everything I want to remember without some help. I work both on-site and out of office, again, depending on the kind of work I need to do. I love when I can work from home in the mornings, knock out a bunch of emails and get my head right for the day. Then I head to the shop where my work is much more team, machine, and materials oriented. Our production team works on an earlier schedule. When the workshop is quiet, late-afternoon/evening is my most productive time. I’ve got a pretty sweet gig, having access to so many different ways of working. Our workshop environment is pretty wild! It’s a good kind of chaos, I would say. 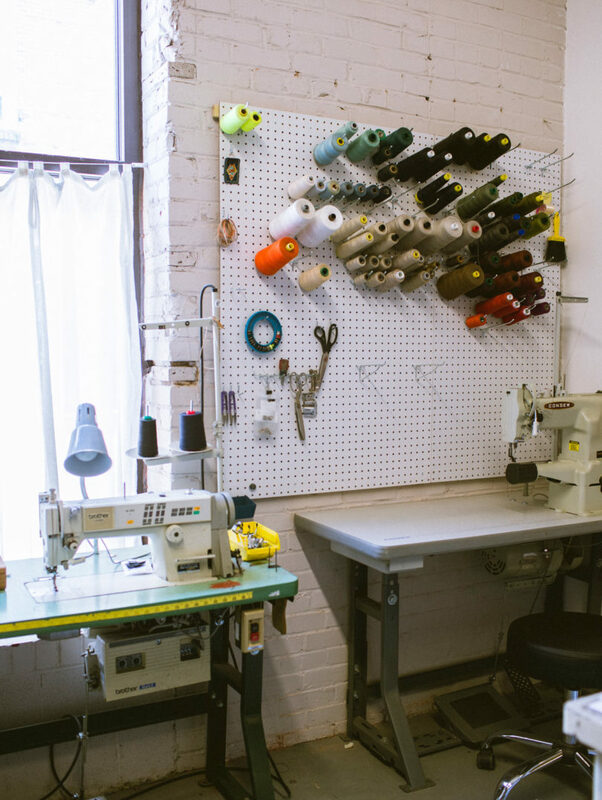 When you walk into the workshop the first thing you’ll see is our retail store called The Curatory (Editor’s note: The Curatory is featured in our Raleigh/Durham travel guide!). We carry our collections there, as well as other lines we love. When you walk into the shop, the first thing you’ll hear is the sound of machines sewing and cutting fabric (if it’s during the week). We cut and sew most of our line on the other side of The Curatory wall. 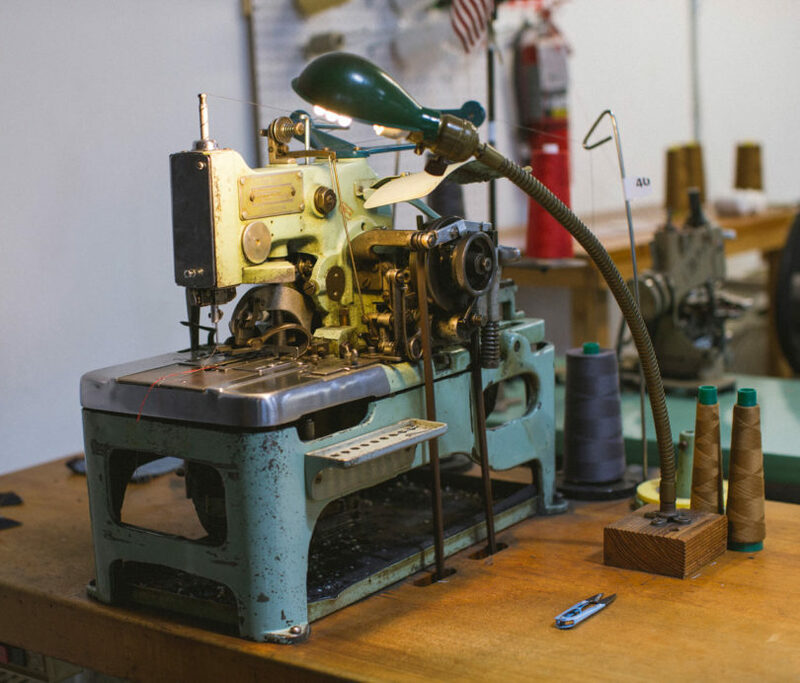 Our workshop is full of old, salvaged and restored sewing machines, most from the 1930’s-1960’s era. There are jeans being sewn at different stages, with parts and pieces everywhere. We also have two huge cutting tables on the workshop floor; that is where everything starts and ends when it comes to design. It is where we make our markers and lay materials for cutting. It’s where we pack massive orders. 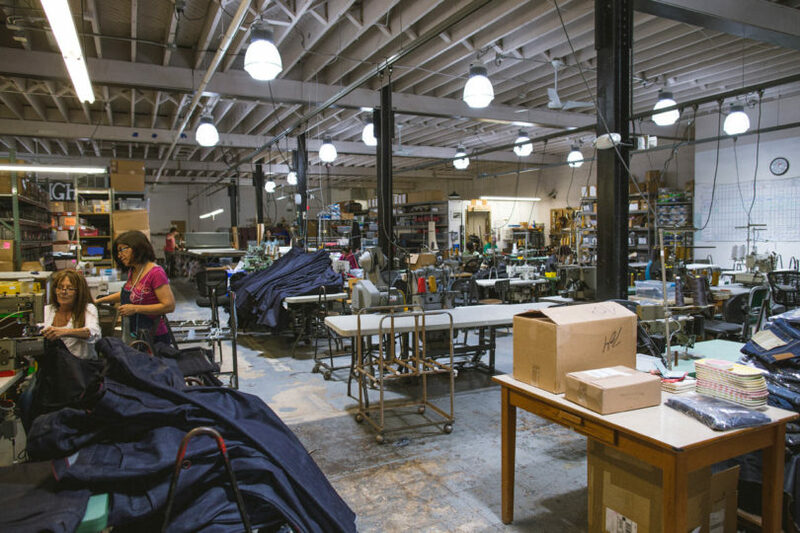 We basically do everything in this space – make patterns, store material, cut, sew, finish, inspect, pack and ship, etc. At first, it might look chaotic or messy, but there is a flow within the space and a method to the madness. I have a little corner on the main floor that we call the “sample corner.” This is where I stash all of the bits of materials I want to hang on to and the end of fabric roles that I love. I have two machines in there and a tiny table so I can prototype samples before they go to production floor for more development. Then in the very back of the workshop is a cozy open office where we have our pin-up boards and desks. That area is where planning, finance, logistics, production organization, etc., happens. 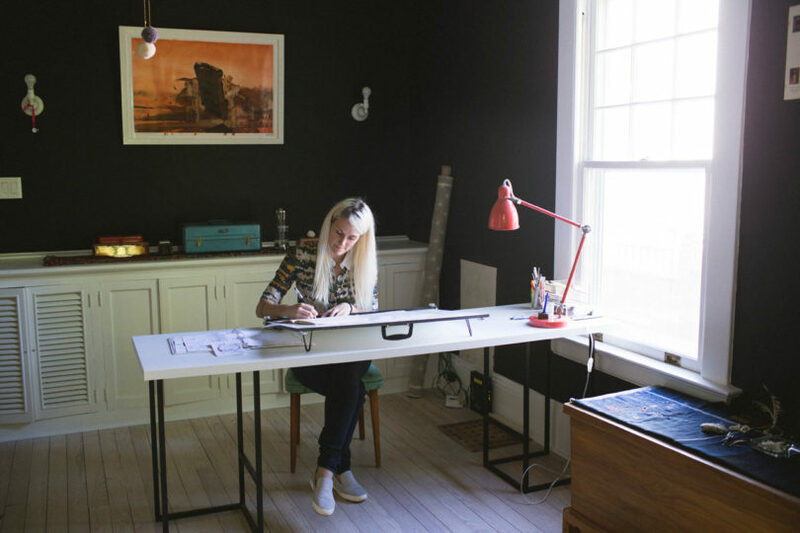 As for my personal studio space in our new home, we’ve designated one “studio” room in the back of the house. Our house is a very traditional house built in 1919. Victor and I have been busy remodeling it and we’re getting close to finishing; I can’t wait. I just finished painting it black and it feels really cozy. 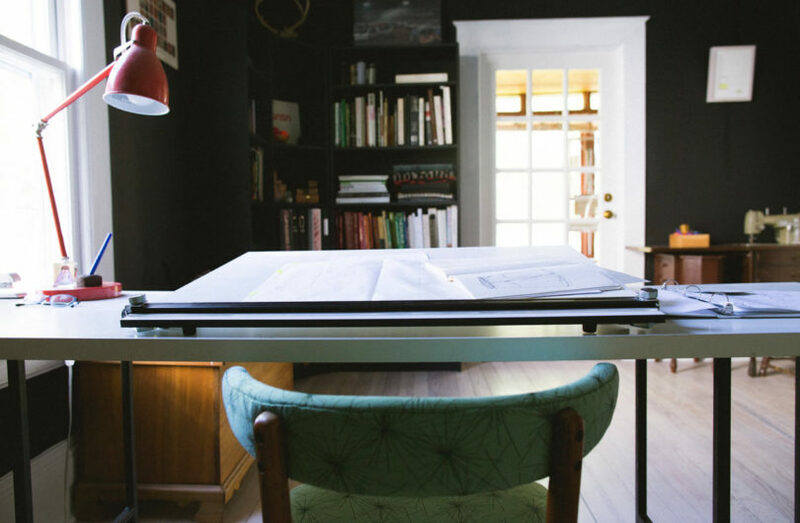 I have inspirational material, things I’ve collected, reference books (design, fashion, drawing, art), art supplies, and a clear space for sketching. In a perfect world, my personal space is a little more quiet and orderly than the workshop, basically the opposite environment. 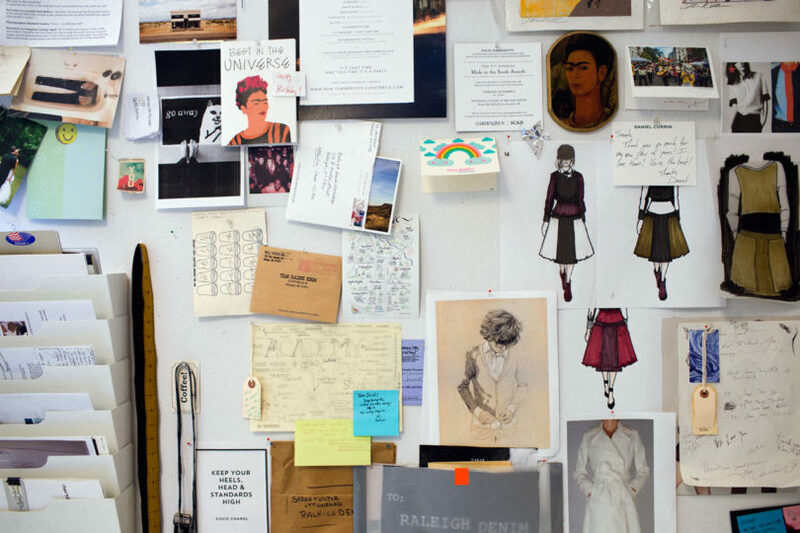 Raleigh Denim is actually celebrating our ten-year anniversary this year, which we are incredibly excited about. Victor and I started in a tiny apartment in downtown Raleigh, where we made our first jeans on machines we set up in our living room, before moving into the back of a friend’s warehouse on the edge of town. We posted up in that old warehouse and built a tiny workshop there for about two years. Eventually, we outgrew it and moved into our current space, in the Warehouse District, seven or eight years ago. When we moved in there wasn’t much going on in the neighborhood. There were a few great art galleries and a really good restaurant, but that was about it. The area has grown a ton over the years; it’s been awesome to be a part of that evolution. We’re neighbors with the CAM Raleigh (the Contemporary Art Museum, of which I’m proud to be a board member), Videri Chocolate, creative agencies, a flower shop, a brand new train station and (soon) a grocery store. It has been really interesting to see it all evolve. Haha, hands down it would be the need for more storage space. It is hard to keep things clean and neat with everything going on in the workshop. We are bursting at the seams. 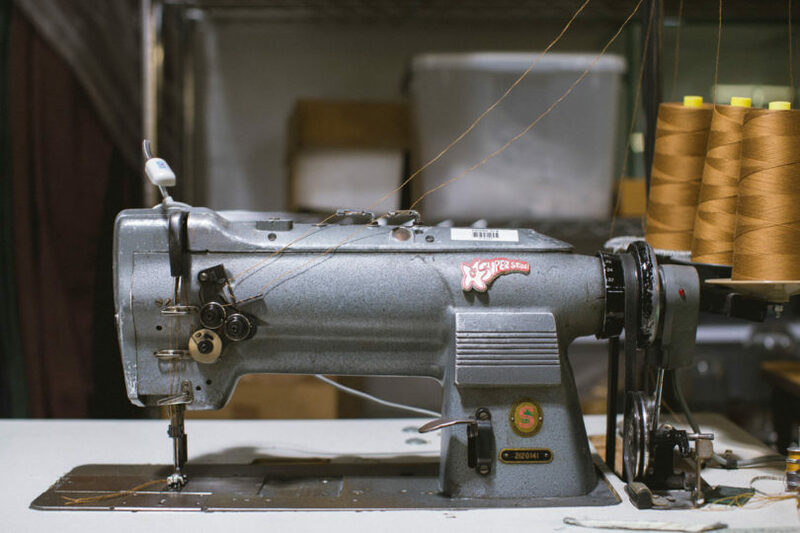 Storing raw materials for production is tricky; we work with everything from tiny needles and rivets to 400 lb rolls of fabric, and all sorts of things in-between. And things are always moving. All the physical parts move through a line to become a physical product, and that line ebbs and flows depending on how big a batch we’re making. I’m happiest when everything has a home and for space to be orderly, so that would definitely be my wish. No, sadly, we don’t. But we do have the best cat on the planet, Magneto, who enjoys being involved in whatever I’m working on at home. Oh yes, music is a big source of inspiration and motivation for us. Early on, when we were bootstrapping the company, we listened to a lot of Outkast and Kanye (and still do today). Both artists are great to listen to when we want to crank work out. 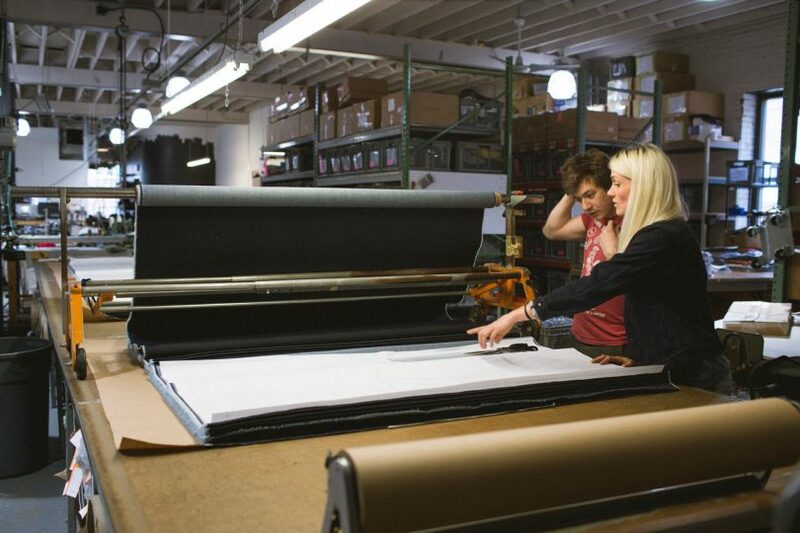 Our entire workshop loves listening to Sylvan Esso, especially if we stay late for a big order or a project. We’ll turn it way up and sing along. I have really big JBL Everest headphones that I wear a lot, with or without music on. They say “don’t interrupt me; I’m in the zone.” When I am listening to music personally, it’s all over the place. Anything from ridiculous pop music to classical. My recently played list on Spotify reads: Daniel Caesar, Big Thief, Aldous Harding, Glasser, Solange, and Vince Staples. I have to write things down. That is how I learn best, so even if I never see the paper again, I have a better chance of remembering the idea if I actually wrote it. And I do a lot of really crappy sketching. I keep at least one notebook with me all the time, but I usually have two: one for productive/work lists and notes and one for personal/inspiration. Rollbahn makes the best notebook I’ve ever used, but I sometimes strike out and try a new one because I love good notebooks and smooth paper and sharp pencils and pretty pens. Yes, I definitely have some inspiration boards. In the office I have two boards in the corner. One is straight inspiration that is always evolving and the collection growing. Photos, notes, old drawings, packaging inspirations, etc. that I pin to the wall. The other board is more organized with material and swatch inspirations that are lined in a row. I really like to touch fabrics as much as possible, so I have to feel the materials while developing the samples. I think I keep the broad strokes of my creative process pretty much the same from project to project. I begin by taking in as much as possible. I need to touch and see things, spread them out and soak them in. I’ll pull out stockpiled ideas and artifacts – things I found on a hike, materials I’ve collected, old garments with important details, photographs, clippings, and drawings. I’ll compile new material selections and recent inspiration, and see how all things get along. Initially, it helps me to talk things out a little. Brainstorming helps me get familiar with the parameters of a particular project. I (usually) think designing within limits and according to rules is much of the fun. Once I have swatches and artifacts and drawings and stimulation and collaborative input and lots of information, I work solo, processing what I’ve absorbed. I’ll test and sample, compare iterations, respond to how things are working together (or not). Nothing beats actually working with the real materials, so I start making prototypes as soon as I can. At some point, a few things – either ideas or materials or silhouettes – start to stand out and a bigger picture takes shape. I love that moment when all the bits and pieces that used to be a jumble become clear. After development, comes refining – lots of fittings, culling the line, dialing in the details and trims – and then we field test the final pieces and get feedback. This last step – feedback about how our pieces exist in the world – is one of the most important to us because we generally design things that get better over time. I think my favorite piece is one my grandmother had hanging in her office for as long as I can remember. It’s a series of butterfly wing photographs, taken at such close range that the pattern in each wing looks like a letter of the alphabet. 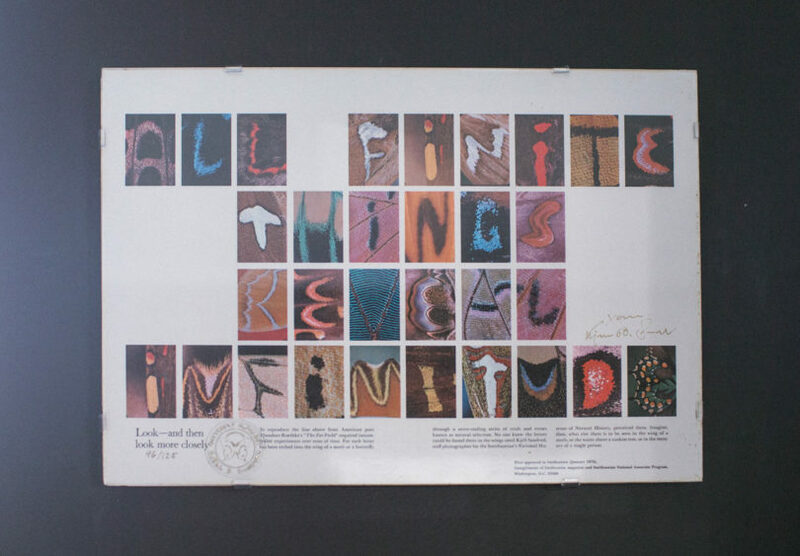 The images spell the sentence “All finite things reveal infinitude.” There’s tenderness to having this message, from my grandmother, in my space now. I’ve always collected things like feathers, wings, shells, etc. because they exemplify the relationship between two things that are seemingly at odds. In hanging the butterfly wing picture, I realized: it’s the finite and infinitude coexisting together in one object that I’m drawn to. I’m also fascinated by the relationship between the natural and industrial. I’m continually collecting examples of these things and keep some of them out around the room for inspiration. In terms of proper art, Shaun Richard’s car crash painting is one of the first pieces we ever purchased and its as powerful now as they day we first hung it. And for Christmas, Victor gave me one of Bill Thelan’s illustrations (of a pickle) because I’ve got pretty serious love of pickles. What tools do you most enjoy using in the design process? My shears are beautiful, and perhaps the most important tool for a clothing maker. I rely heavily on my industrial single needle sewing machine; I’ve sewn almost every prototype and every special project we’ve made with it. And thread. I love picking the perfect color from a rainbow of spools of thread. 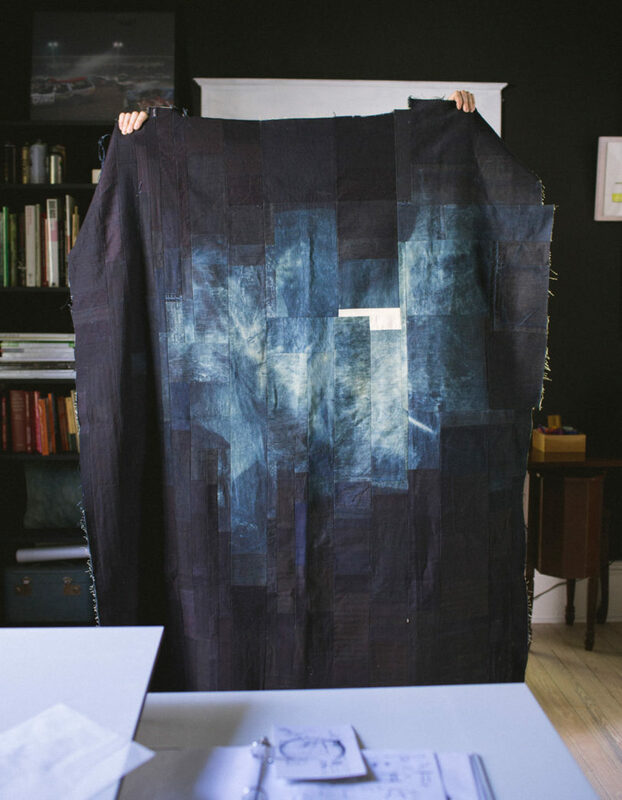 I’ve been working on this textile piece that has turned into a quilt. 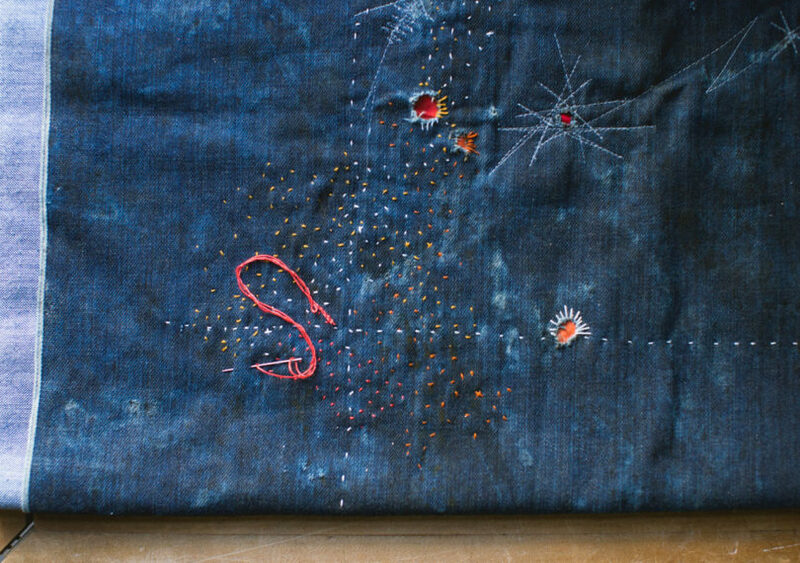 It started with two tiny scraps of fabric I loved, sewed together. I’ve been adding to those initial pieces, whenever I have time, using darker material as I go. It’s become a denim blanket with an almost white center, an almost black edge, and beautiful blue gradient in between. I’ve been working on it for about a year now. It almost has become a meditation. Another piece that’s dear to me is my pair of broken-in denim jeans. I’ve been patching and patching, and I will keep patching for as long as humanly possible. Someone recently offered to buy them, but I’ve given them so much time and so many stitches, I don’t think I’ll ever part with them. I don’t think a whole lot about “making it.” I feel successful when I’m making progress, able to enjoy my work, and when the people I work with are proud of and enjoy their work. I think that’s the case most of the time, so I feel successful to some degree. But I feel success in moments; it isn’t something I dwell on or a mindset I stay in. Sometimes it’s gone almost as soon as I recognize it, and then I focus on what’s next, how to be better. I know I’m in a good spot when I look back and feel proud of what we do and am simultaneously excited about the future. I just cleaned it off, so probably some jeans, a stack of papers, Post-it notes, fabric headers, rulers, scissors, pens and pencils, and two or three tiny things that make me smile. 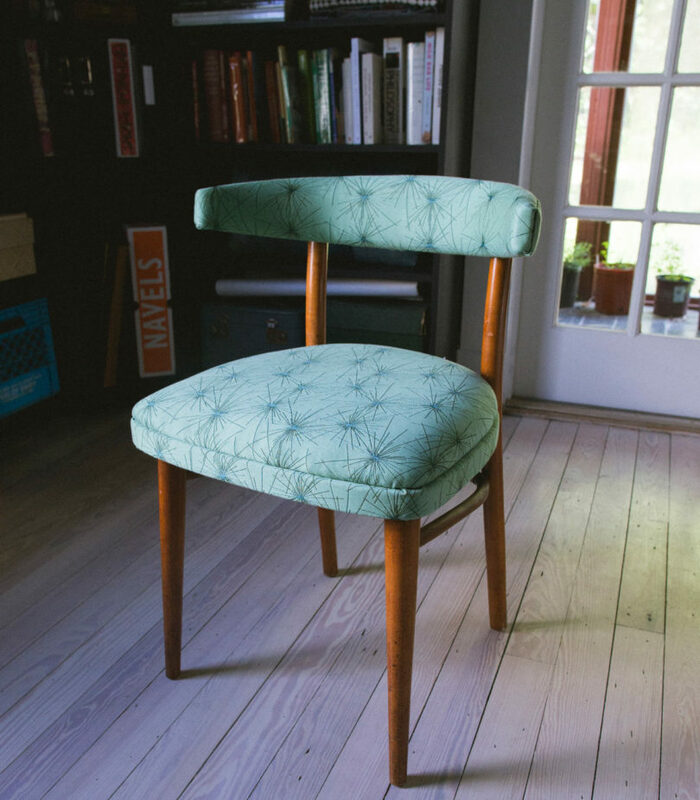 Other than clothing, we have an old school chair upholstered in the material we designed with Bernhardt Design. It’s a pattern that evolved from an old sketch I had from my days in Design School. 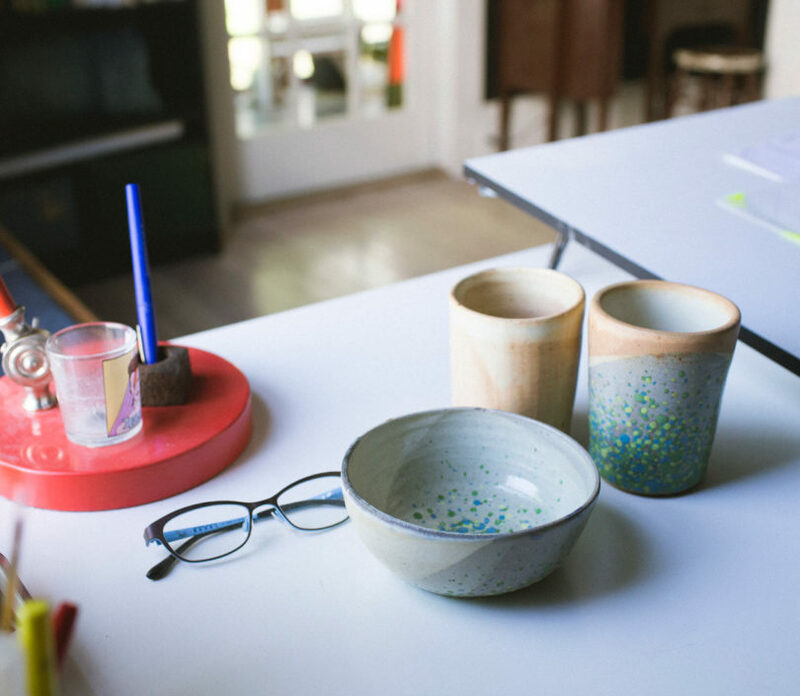 We also have some pottery I made at Penland, a table Victor made, and so many other small things, it’s kind of hard to keep track.